Posted by Dave Emory ⋅ June 2, 2018Post a comment Email This Post Print This Post Tweet This! On Tuesday, June 5th, KFJC-FM broadcast an eight-hour memorial program about the assassination of Robert F. Kennedy on the 50th anniversary of that event. Beginning at 2pm, Pacific time and concluding at 10pm, much of the broadcast will feature AFA #9, the description for which is below. Recorded on 6/5/1985 (the 17th anniversary of the killing), the broadcast features significant analysis from The Assassination of Robert F. Kennedy by John C. Christian and William Turner. In addition, the broadcast will feature FTR #’s 582 789, 809 and 892. 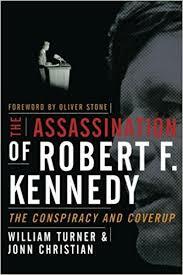 Introduction: The killing of Senator Robert F. Kennedy is often perceived as the one major American political assassination that was indisputably the work of a “lone-nut.” Although the crime superficially appeared to be the work of Sirhan Sirhan acting alone, there is conclusive evidence that such was not the case. The program presents forensic evidence that points conclusively to more than one gunman being involved. Coroner Thomas Noguchi’s autopsy revealed that the fatal shot was fired from less than three inches from the back of Senator Kennedy’s head. Sirhan was standing several feet in front of Kennedy. Noguchi stated that just before he was to testify in court, a member of the D.A.’s office tried to get him to change his testimony. In addition to firm indications that more than 8 shots were fired (Sirhan’s gun only held 8 shots), the program presents evidence that Los Angeles Police personnel destroyed evidence that Sirhan did not act alone. The program highlights the role of former Los Angeles Mayor Sam Yorty and former Los Angeles Police Chief Thomas Reddin in laying a misleading trail of “evidence” pointing to Sirhan as the lone-nut assassin. Contrary to the official story, numerous eyewitnesses believed that people other than Sirhan were involved. Much of the program focuses on the Reverend Jerry Owen, a right-wing minister believed by many to have been one of Sirhan’s handlers. Connected to a political milieu that was investigated by New Orleans D.A. Jim Garrison in connection with President Kennedy’s assassination, Owen gave conflicting accounts of how he came to give Sirhan a ride on the evening of the assassination. In a subsequent court case, testimony was given by associates of Owen that placed him in the company of Sirhan well before he claims to have met the accused assassin. Owen possessed a large amount of cash in large bills at the time. Other program highlights include: Evidence that Sirhan had been placed under mind control; discussion of Dr. William J. Bryan (Sirhan’s probable mind-control programmer); the role of the American United organization of Anthony Hilder and John Steinbacher in spreading disinformation about the assassination; the presence of Ed Butler at a press conference staged by Hilder and Steinbacher the day after the killing (Butler had arranged for media appearances for Lee Harvey Oswald in New Orleans, at which Oswald proclaimed his supposed Marxist sympathies); links between Hilder and Steinbacher and people investigated by Jim Garrison in New Orleans; Hilder’s curious behavior in December of 1967, indicating possible foreknowledge of the assassination of Dr. Martin Luther King; Jerry Owen’s connections to Gail Aiken, the sister of Arthur Bremer (the accused shooter of Alabama Gov. George Wallace); the fascist and national security connections of Thane Eugene Caesar, the security guard believed by many to have been the actual assassin; connections between the Sirhan family and political supporters of Richard Nixon; the intelligence backgrounds of Manny Pena and Enrique Hernandez, the L.A.P.D. officers who supervised the “investigation” into Kennedy’s slaying. his assassination fifty years ago today. Plimpton. Johnson and Grier have conflicting accounts of what transpired that night. I’m not impressed with either. of the supposed murder weapon. Grier, however, asserts HE POCKETED THE SIRHAN GUN, later gave it to Johnson in the ambulance and Johnson handed it into LAPD. as a Republican this year but dropped out. He supported both Donald Trump and Ronald Reagan in their presidential campaigns. a man with CIA connections via the Paris Review, is positioned behind and to the right of Sirhan AND in front of and to the left of Michael Wayne. and Kennedy autographed Wayne’s rolled up poster moments before he was killed. Wayne also had connections to right wing extremist Keith Gilbert. And of course photos show Plimpton Uecker and Grier grabbing and pinning Sirhan. So Sirhan co-counsel William Pepper has as many suspicious actors at the RFK assassination as he did in the MLK murder.